Sometimes referred to as a Gentlemen’s Chest, the Amish have designed our solid oak sleigh style chest of drawers to be the perfect companion to a bedroom full of other sleigh style furniture, or perfect to stand on its own. 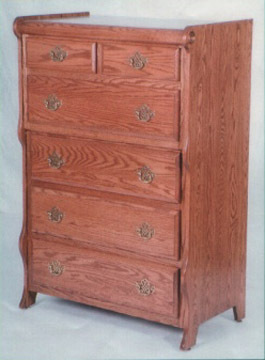 The ladies get the dressers you can sit in front of if needed, but the guys tend to like the combination of plenty of big, roomy drawers, with a couple of “junk drawers” at the top, plus it is the perfect height for someone who likes to stand in front of their bureau while getting dressed. Finally, let’s not forget that you can get it in cherry too!